Winter weather getting you down? Cheer yourself up with a brightly colored handbag! Our Orleans East-West Satchel is one of our newest shapes. It comes in Black, Teal, Wine, Taupe and Rust. Arlene here. Susan is in Africa on Safari, getting lots of inspiration for fall '19. So I'm holding down the fort here in "Savage" Los Angeles. Cant wait to see all her great photos! Meanwhile, here are a few to inspire your animal instinct to buy a new handbag! Metro Tall Satchel in Tobacco Italian Napa. Lucque has really evolved this season, with lots of new shapes and fashion colors to suit your every whim. We’ve got teals and wines for your more rambunctious moods, and lots of neutral tones for your subdued days. And for a bit of fun, we have some unusual hand stitch thread colors on neutrals. Hi. I'm Arlene. Technical Designer and inhouse sales manager for Lucque handbags. We've got lots of beautiful bags for summer. The Orleans Mini Satchel is one of my favorites. For this season, we changed to a round lock. Really cute. And it comes in White, Navy, Orange (WOW!) and Stone. Lucque is proud to be carried by the upscale boutique of Wolf & Badger in London, in the fashionably chic Mayfair district on Dover Street. Wolf & Badger is known for discovering emerging designers in every area of fashion. They cater to a clientele eager to shop for beautiful things that aren’t seen in dozens of other boutiques. Instead they offer indie brands that will shape the fashion of the future. Stop in when you hit London or checkout their website, wolfandbadger.com. Cheers, and enjoy your Lucque. Sculpted and cast in white bronze, this abstract piece of jewelry is the shape for all Lucque bags to come. It's timeless, it's distinct and it stands for the artful and feminine essence of Lucque. Lucque’s Spring / Summer bags are arriving soon, and we will show them on the website by mid April. We will also release some pre Fall 2015 bags — because thankfully -- many of these bags are seasonless, something I always consider important when I'm in the market for major $ wardrobe investments. I'm sure you have already noticed the early summer releases from major brands, and the colors are fabulous: light blueberry, lavender, sailor blues, white, white and more white, minty greens and turquoise. My inspiration for this new season has moved toward nature’s neutrals: terracotta, dark moss, brown clay, wheat, sand, and a golden olive oil hue from the Med. They look great together for a quiet sophistication; they thrill when paired with bright whites and blues, or dusty tones of blue and mauve. So if you are keeping your palette soft this spring, these neutrals handbags will look fresh and add importance to your pastels. If your seasonal colors are highly saturated and eye-popping, Lucque’s neutrals will be a great companion for balance. But most of all, these beautiful neutrals, found in the nature of desert and mountain, translate well into Fall of next year. Lucque’s newest shapes run from the largesse of totes, to sweet and small shoulder day-bags. We stressed the artisan look of large top-stitched leather, handmade hooks, woven handles, torn flaps, raw edges laced together, natural horn, horsehair tassels and handblown beads. 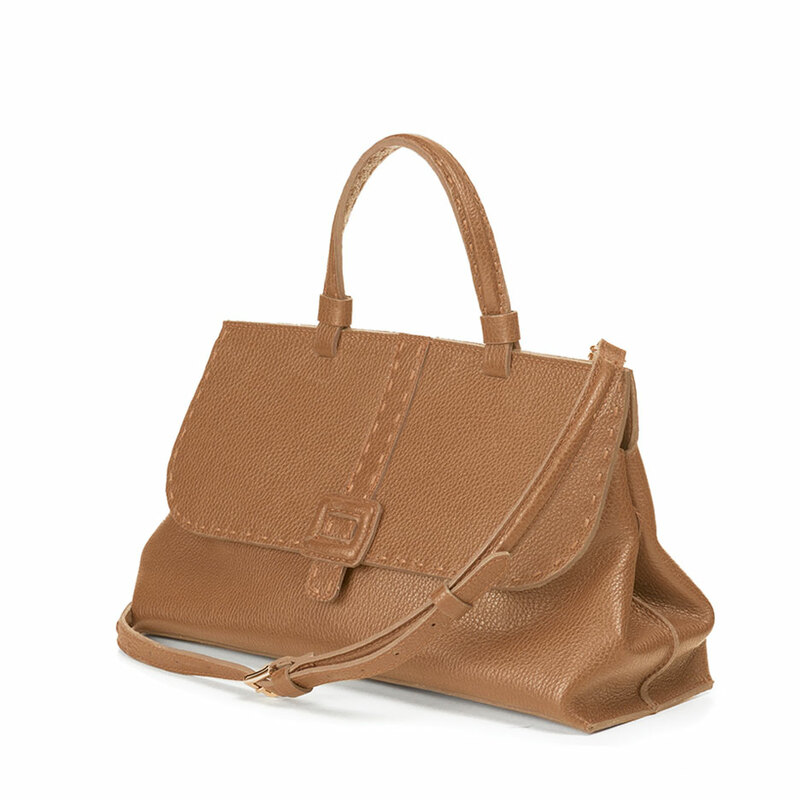 A new Lucque bag is soft with the gentle draping of calf skin. And we have a few handbags that stand at attention for those who are partial to more structure. Get ready for a fun collection, and enjoy your Lucque.